Here is a beautiful dish to start the Spring right. Accept I cooked this a few weeks ago an now am entirely living on sandwiches and take out. I would kill for a nice meal like this right now! It's one of those dishes that you will remember, and that is just vegetables, but you don't even notice. It is also one of those meals that is not for inpatient, just like eating crabs. If you enjoy playing with your food and nibbling on each artichoke petal to get the yummy goodness out of it, this is the meal for you. Another amazing dish I learned to make from my mom and it is more common in south of Croatia than northern parts. Cut the top third of each artichoke and wash well between the petals, then put in a bowl of cold water with juice of one lemon. Soak for two to three hours. Leave your peas out to defrost a bit. Combine all of your filling ingredients into a bowl and mix well. 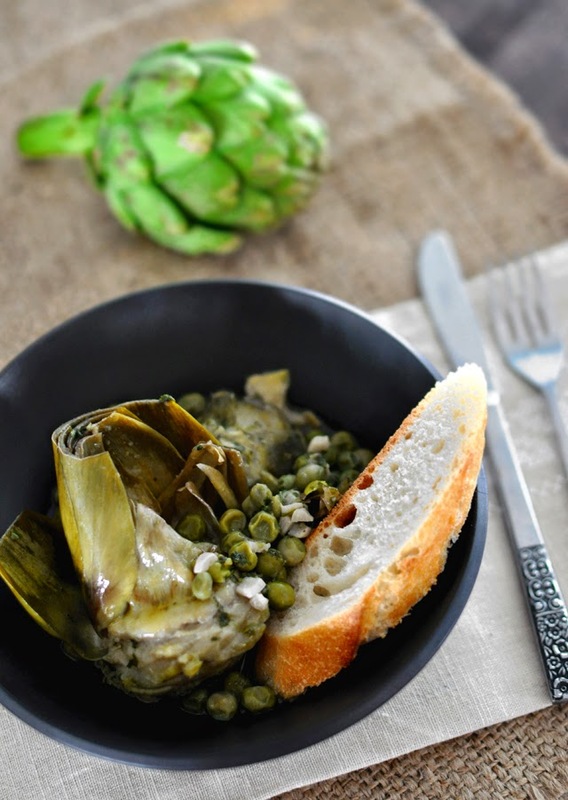 Cut of the stems from each artichoke so you are able to arrange the artichokes in a pot with them standing up. Open up the petals as best as you can with your fingers and fill them with your mix and little bit of your peas, about one cup. 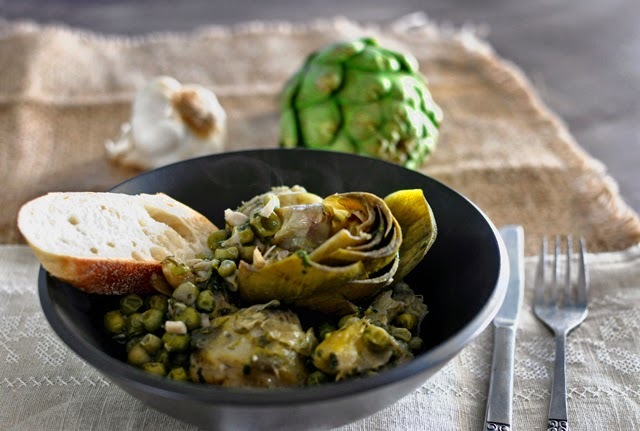 Arrange the artichokes in the pot and put your leftover peas all around them. Season with salt and pepper and add olive oil and some water, just about to cover everything. Cook on medium heat for half an hour and then lower the heat and cook for another 30 to 45 minutes. Serve with extra olive oil for drizzling and some good crusty bread. Enjoy each petal and getting all of the juicy meatiness out of it before discarding it on a separate plate, dunk the bread, eat the peas and enjoy a nice, delicious and healthy meal. Getting to the heart of it is like hitting the jackpot!